Normally when looking for a new game you have to head on over to your Favorite Local Game Store (FLGS) to thumb through a copy of different games, or maybe you get to sit in on a demo at a local con. Generally speaking going to an online forum results in heated discussions from ravenous fanboys. If you want to stir things up, go to a game forum and ask to be "sold" on a game system. The fine folks over at Kenzer & Company...yes, I'm biased since I like to play their game and know pretty much all of them personally, have given folks who might be interested a third option for checking out their game. 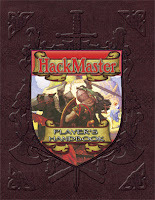 They've just made a few pages from the HackMaster Player's Handbook available for review. The is an illustrated example of play which is 12 pages of the Knights of the Dinner Table playing the new game. It is a great way to see some of the mechanics of the game "in action". For some, HackMaster still has a bit of a stigma because many people just saw the 4th edition of the game as one big joke, which I just don't get. Yes, there were mandatory comedic elements in the ruleset as part of the license, but HackMaster 4th Edition was a very playable game that was 50% 1st Edition AD&D, 25% 2nd Edition, and 25% House Ruled Awesome. KenzerCo has also made available a HackMaster History which goes into the backstory a bit better. You needn’t ever wait for your turn – the whole game is based on the ‘seconds’ system, much like timekeeping in the real world. If your character wants to take an action or change his mind in the middle of an action, by all means, do it! No sense standing around. Both shields and armor make it easier for foes to hit your character – they simply absorb damage and deflect blows, making your character less likely to be injured. Just like in real life! Characters use an active defense (and roll to defend as well as attack); a low roll isn't the end of the world. So you rolled a six against that orc? Don't whine about missing until the GM rolls for the orc's defense. You still have a chance – he may roll a five. Going first and fastest is not always best. Charging into a group of surprised foes may be great for the first strike, but it may also be a way to find yourself surrounded if your allies aren't as quick as you. Being surrounded or even outnumbered is a very bad thing. Taking on multiple foes, even if far inferior to your character, can be bad news. A large group of orcs will be a tough fight even for high-level characters, when in other games this would be a cakewalk. Well, it wasn’t one in the Mines of Moria and it won’t be one in HackMaster, either. Ranged weapons don’t work quite as well in real-life (or for low level characters) as they do in most recent RPGs. Frankly, I’d rather be shot with an arrow from a longbow than hit with a broad sword if forced to make that choice. Think about it. Every character cannot do everything and no character is an island. HM is a game of hard choices for each character. You need a TEAM of characters with complementary skills and abilities. HackMaster really is a game where you need to know the answer to the question, "Who's Watching Your Back?" Each character class has a specific role. Fighters fight and should be in front. Mages should be kept out of melee at all costs. Thieves should be on point but ready to let the fighters take the lead in combat. Clerics are the party's all around support. 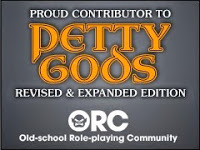 Each role is important to party survival. Playing a thief (or worse, a mage) like a fighter just gets the character… and sometimes the party… killed. All the min/maxing during character creation doesn't mean a thing if you don't use your brain during the game. That spreadsheet that managed to save you 4 BPs on your mage/thief’s Skilled Liar skill doesn't mean much if you try to straight-up melee a troll. 3d6 in order does NOT mean you usually get an unplayable character – HackMaster drags the average 3d6 character ability back to 10-11 from 15-16. Intelligence is important in melee – it increases your chance to hit an enemy. That’s why the stupid giant can be defeated by the clever warrior. There are no perfect characters, but there are many different ways to create a great character. You can never tell the outcome of a battle before it starts. Just because your fighter is at full hit points, killing that goblin with the spear is never a sure thing. Simply because you've encountered goblins/kobolds/zombies in other games doesn't mean they're just as easy to defeat in HackMaster. The GM is not out to kill you – he’s out to kill you if you are foolish. A tactical withdrawal is a perfectly acceptable option because far more often than in other games, you’ll wind up in over your head. In the end, the best advice I can give you is that HackMaster is a game of difficult choices. You will never have enough building points to buy everything you want (or even need). There is no one ‘no-brainer’ weapon that every combatant should use, nor is there one class that bests them all. The BEST advice is to just play the game with an open mind, ready to learn. Nothing brings out the genius of HackMaster like actual play. During play you begin to see how well the system flows and works. This is a Game written by people who love to play it." You can read the forward to the book here.